Delivered on Google's "world-class platform," Google Analytics is a powerful way to monitor your site's statistics. 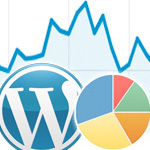 As flexible content-publishing software, WordPress provides a variety of ways to add Google Analytics (GA) to your web pages. These techniques range from including the GA tracking code directly to using plugins that are easy to customize from within the WP Admin area. In this DigWP post, we cover it all with 5+ ways to add Google Analytics to your WordPress-powered site.